Beschreibung: Die mehr oder weniger berühmte Ferkeltaxe aus Zeiten der Deutschen Reichsbahn. Bis 1997 noch auf der Strecke Zossen - Sperenberg - Jüterbog unterwegs, obwohl Sperenberg - Jüterbog schon 1995 stillgelegt wurde. 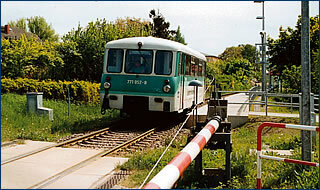 Bis 1994 fuhr diese Bahn auch auf der Insel Usedom, bis die DB die Strecke aufgegeben hat. Heute fährt dort die UBB. Die Strecke Zossen - Jüterbog ist mit 2 SEV Stecken bedient. Dieses Fahrzeug fährt noch fast durchgehend bei der PEG (Priegnitz). Seit wann ist DAS bitteschön eigentlich eine S-Bahn ????? The mother of a 19-year old soldier is regretting the moment she enlisted her son in the Guyana Defence Force. She is now desperate for him to be discharged.However, she may have to wait until he completes his mandatory three-year service even if it means enduring the constant beatings he has suffered at the hands of his colleagues.The woman, Dakota Samuels, is claiming that despite assurances from a high ranking GDFG officer, her son, Private Linden Samuels,NFL Jerseys Outlet, will be better off outside of the organization he enlisted in a year ago.Her concerns come a few weeks after the GDF granted a discharge to another Private, who wanted out of the military after he was allegedly tortured and humiliated by his superiors.According to the woman, her son was subjected to a beating by his colleagues while at Base Camp Tacama last weekend.While his alleged assailants have reportedly gotten off scot-free, Private Samuels has been subjected to 14 days in the Camp Ayanganna lock-ups for allegedly disobeying a lawful order.Private Linden SamuelsThe situation has resulted in frustration for the rank, since he alleged that his assailants are being favoured by supervisors.Dakota Samuels told this newspaper that she received a telephone call from her son last weekend, advising her to seek an audience with officials from Military Intelligence at Army Headquarters, Camp Ayanganna, since he was beaten by other soldiers.The woman said that she went to Camp Ayanganna where she explained to an officer there what her son had told her. She was subsequently referred to a Lieutenant Colonel stationed at the GDF base at Timehri, who promised to investigate the allegations since he was scheduled to travel to Tacama the following day.A few hours later the Lt. Colonel contacted her and related a different version to what her son had told her. In fact, the officer claimed that it was Samuels who was the attacker during a fight at the base. ?I gave him the benefit of the doubt because I was not there,? the woman said.A few days later she received another telephone call, this time from a female at the training base, who told her that her son?s cellular phone was taken away and he was being threatened with death. ?They were taunting him, telling him that he will come out in a body bag. ?That certainly sent shivers up Samuels?s spine as she thinks about what could happen to her eldest son.she told this newspaper that the fight her son had with other soldiers have left him with injuries that are not being treated since the matter was not reported to superiors at Camp Ayanganna.This led to her husband contacting a top ranking army officer complaining about the treatment being meted out to Private Samuels, and getting an assurance that it will be investigated.On Monday last, Private Samuels gave a statement about the circumstances surrounding his beating.He subsequently requested to leave the army but this was denied by the high ranking officer who gave him the option of being placed in another unit. ?The colonel threatened him telling him that if he ever left the army without being discharged, he (Colonel) will personally arrest him and lock-him up,? the woman told Kaieteur News. ?I told Lovell, I want my son out and he said ?no, that he has to finish his three-year contract?. But I might get a dead son by then,? the woman added.She said that the colonel assured her that her son ?now has a godfather in the GDF? who will look out for him. However this did not convince Samuels that her son would not endure the beatings he has been subjected to since he joined the army.She said that while she is satisfied with the way the military intelligence handled the matter, her meetings with senior officers of the GDF have done little to allay her fears for her son?s welfare.She admitted that when her son enlisted in the army, they were aware that it would not be as if he was joining the boy scouts. ?But people?s children must be looked after properly and they must administer justice there in a fair way,? Samuels concluded.